What we see is that kids from the richest homes score 1157 (IQ 118) while kids from the poorest homes score 895 (IQ 100). This gap would be even larger except that only the smarter kids tend to take the SAT. If everyone took it, the average IQ of both rich kids and poor kids would go down, but it would especially go down for the poor kids since far more poor kids don’t take the SAT, so the gap between the rich and poor would increase. It’s unclear if this gap is because rich kids inherit high IQ genes from rich parents, or if the SAT is just culturally biased against poor kids. Adoption studies are needed to settle this. lol and they’re not that smart. These posts of yours are not making the case you want them to make. 262 points = how many SDs? where are there SAT composite percentiles? 1) About 2/3 to 3/4 of poor kids probably don’t even write the SAT (though nearly all rich kids probably do). If all the poor kids wrote it, their average IQ would drop from 100 to perhaps 85, thus widening the gap between the rich and poor kids to roughly 30 POINTS! I don’t actually believe there’s anywhere near a 50 point IQ gap between the mildly rich and the mildly poor; what this data actually shows is that the SAT is probably culturally biased against poor kids. A culture reduced IQ test would not show such a ridiculously large gap, which is far bigger than even I would argue. Which would increase the gap between POOR AND AVERAGE, not the gap between AVERAGE AND HIGH. Not necessarily. Regression to the mean is not necessarily regression to the general population’s mean. If the kids are from ‘old money,’ then their population mean is probably higher than average. If the kids are from ‘self-made’ millionaires, then the chance of what you’re talking about is higher. The data mostly disagrees with you, and I’m unsure how or why you can’t see it. Oh, I see that slope decreases mildly at higher levels, but that must happen eventually, otherwise the kids of billionaires would all have SAT scores in the millions. Income is not normally distributed but SAT scores are, so the linear relationship must break down using raw data that hasn’t been normalized. And actually, if everyone took the SAT, the gap between the average & the rich would also increase because most average income kids don’t take the SAT. Any reason….? I’m just saying I don’t know and we don’t have any data either way. It’s staring you right in the face. Elite level income does not come with elite IQ. Your earlier chart of data showed as much. This graph shows the same. The income percentiles to go with your earlier chart showed the same thing: 54k is a huge percentile leap from 26k. 86k vs 54k is a much smaller leap. Based on what, exactly? If it IS true that high IQ CAUSES high wealth, then families who maintain their wealth are likely to be high IQ and generally possess a genetic mean greater than the population’s. Contrast that with ‘new money,’ which is likely the result of some sort of aberration in otherwise “normal” genetics. I’m just using your own conception, here. But if we don’t assume that, and we see these children who come from parents who are wealthy scoring high….then we’d need to see how these children fare versus children who score at the same level from poorer families. Kids from roughly the bottom 7% of household incomes ($10 K) have SAT scores of 895. 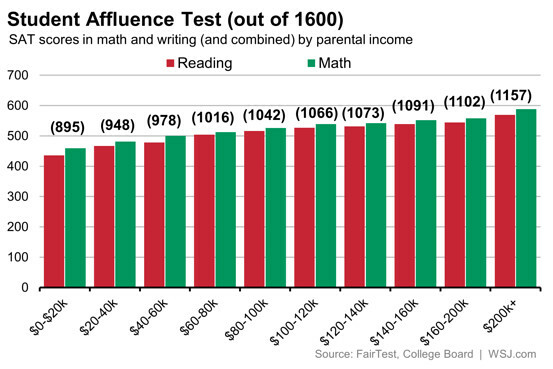 Kids from roughly the top 7% of household incomes have incomes ($180 K) have SAT scores of 1102. Kids from the median household income (50 K) have SAT scores of 978. So the cognitive difference between the top and the average is actually greater than the cognitive difference between the bottom and the average, contrary to what you’ve been arguing. But one shouldn’t over-interpret a few data points from one study. Lots of noise in any one data set. No it isn’t. The entire graph is a spread of ~18 IQ points total, and each score represents an above average IQ (your formula underestimates by a smidge). Which means that, continuing on with your theory that these kids are all regressing to the mean, above average IQ really does not matter much — LOOK AT THE SPREAD. When people study billionaires and report findings of “45% in the top 1% of IQ,” they are usually measuring educational attainment as a proxy for IQ — which is bogus. What makes people wealthy is a) risk-taking and b) impulse control (NOT SPENDING THEIR HARD-EARNED MONEY). peepee’s only in business because you and I comment on his retarded blog. stop giving the Untermenschen air and they die. peepee hasn’t and never will have an IQ above 95. An 18 point spread is ENORMOUS considering the factors I mentioned above, and the reason all the IQ’s are above average is because they’re college bound seniors. Anyways, I’m going to do another post soon that will clarify these points. As I explained, IQ only explains 16% of the variation in income, so there’s plenty of room for other factors to loom large too, including risk-taking and impulse control, though I’m not sure how much research has been done on the economic value of those traits.. I understand it is interesting to make posts that are didactic, but you’re abusing the simplicity and are misssing badly. What’s average iq of Monaco and Luxembourg??? These posts hurt your credibility. he means it would be more accurate if the data were disaggregated by race. Can we see the direction of causation from the shape of the curve? according to a percentile matching of highest and lowest estimate of the Pearson’s correlation (which doesn’t apply because the relationship isn’t linear) the correlation is < .35.
of course it depends on what the percentiles really are. I just went by the interwebs. The nice thing bout the meritocracy and testing is that among low income families there are still a lot of exceptional students . That’s how Murray get into Harvard. some of your readers argue against whatever statistic is used (even tho stats are useful to summarize data). they may have more difficulty arguing with a scatterplot of actual data points plotted on X/Y axes (even though stats are a convenient way of summarizing those). pejorative comments from those who are unaware of the vast research on intelligence/ability/g are unhelpful. the scatterplot can help someone visualize & realize that persons high on the income variable yet somewhat low on the achievement variable do indeed exist (& vice versa), yet — overall — there is a general positive co-relationship between the 2 variables. please ban comments by those who don’t know what the first unrotated factor created when mental tests (which all positively correlate – yet an INDIVIDUAL may be high on one thing & low on another) are subjected to factor analysis (first unrotated factor aka “g” – responsible for >50% of the variance within that set of mental tests). That “g” has tremendous predictive power, BOYS. 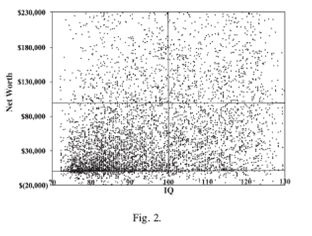 Even more so if very low-IQ people were to take SAT type tests — think of the scatterplot then, boyz! you can imagine that what might look like a small positive relationship (such as SAT & college grades) is actually much larger when you don’t restrict the range! fo’ real, yo! and factor analysis as “something real” would work much better if the elements underlying the “Factor” didn’t also correlate with one another after we control for their correlation with the overriding factor. of course that is not reality and you know it, but hey, you got to spit out some fancy words, didn’t you? These two plots are interesting in not just about slight correlation, but also because the standard deviation increases with higher IQ. 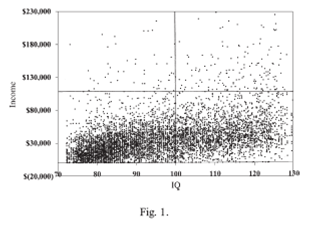 The points are darker for lower IQ (even if same SD away from mean), compared to points in the higher IQs. High standard deviation also means higher probability of being richer. I mean, richest 5 percent of low IQ folks are way poorer than the richest 5 percent of high IQ folks. Very different than when one considers only the mean. I bet if we had a chart showing the probability of being a billionaire, that probability would be much higher for IQ 120 than IQ 100 and much higher for IQ 140 than IQ 120. I would not be surprised if IQs 160 are more likely to be billionaires than IQs 140. Of course the probability at all IQ levels would be incredibly tiny, but that doesn’t mean it wouldn’t increase at very high IQ levels. Fantastic charts which are real correlations like. When people saw linear charts, they often thought correlation as “equal”. They are fantastic charts (though they would have been much better if limited to older people who’s income potential has been more fully realized). One of the things the chart debunks is the popular notion that low IQ better predicts poverty than high IQ predicts wealth. The chart shows plenty of examples of low IQ people with high incomes and high IQ people with low incomes, showing that outliers are common in every combination. lol wrong again. The lower left section is much darker than the same section on the right. The chart and data reinforce the low-IQ poor High-IQ-little-if-anything-to-do-with-being-rich notion. You mean right again. Clearly the chart shows many low IQ people with high incomes & many high IQ people with low incomes. The notion that IQ & money only correlate because low IQ causes poverty is just a self-serving way for smug liberals to feel superior to the poor without feeling inferior to the rich. The chart is darker on the left half because low income is more Gaussian. saying it’s clear doesn’t make it so. ‘You mean right again. Clearly the chart shows many low IQ people with high incomes & many high IQ people with low incomes. It shows significantly less low IQ people with high incomes than high IQ people with high incomes, which helps my main point. To get a feel for how much IQ matters, just lop off the outliers — the main group rises a little with IQ but not very much at all. It matches your first post — 54k vs 86k, which simply is not a big percentile jump. maybe, maybe not. but such wonderful feelings of properly directed superiority and justified rationalizations for being less rich are only incident to the fact that the data agrees. I believe the net worth plot is misleading. The person should have zoomed out to give a better picture. So that we could see the extremes. Probably not done on purpose, but if you zoom in the data, what you will see is random distribution everywhere. unfortunately panjooby you yourself don’t know that g and the principal component are NOT the same thing, but have been conflated by Jensen. furthermore the OBVIOUS clustering of the POULATION about a principal component tells one nothing about an individual. the projection of the individual’s battery score onto his POPULATION’S principal component is meaningless. it might be no different. if the distribution for those taking the SAT has the same SD but higher mean than the population as a whole. Isn’t the SAT more a regular curriculum test than an IQ-proxy these days? Are there fewer questions that deal with abstract reasoning ability in favor of more questions dealing with direct application of skills learned from school curriculum? Would high-IQ low-income students who have high aptitude but poor study habits/a home culture that doesn’t value education/who cut class/etc do worse on the new test than on the more g-loaded older test? I don’t know how much it matters though. I don’t doubt the results at all. Money is still more important than IQ for accomplishment in life or academically. If you are born a family in the top 1% of income your success is virtually guaranteed. Born within the top 1% of IQ, all else equal, very much less so. pumpkin has a low IQ. best avoid him and make him cry. she’s got a rush on a white girl. Swank and Ypres make this guy look like a white trash moron. If he’s white. Swank and Ypres make this guy look like a white trash moron. You are Ypres. And you’re feeling very embarrassed because I corrected you on some math and stats concepts you had trouble with. And so you’re lashing out like the big dumb wounded animal that you are. I’m Ypres? So you’re paranoid AND retarded. The only correcting has been done by Ypres and Swank of YOU. And the only screaming baby on this blog is YOU. You’re a joke. IQ < 85. Math IQ < 70. You’re obviously very wounded & embarrassed & are lashing out. thinking about it more, smarts may lead to wealth when they are very high because a smart person at that level unconsciously makes him or herself indispensable. Very smart people hate showing their work and often do not understand how they get to the conclusions they get to (unless you pin them down and make them explain, which usually involves a complicated “retrace my steps” that annoys and exasperates them while they try to struggle to put labels on abstract concepts they probably haven’t trained in). By being smart enough to arrive at correct conclusions without a desire to “show work,” you keep others in the dark about your methods. If you get a few good decisions and results under your belt, you get more and more opportunities…rinse and repeat. HOWEVER, I imagine these types of smart people will have varying results on an IQ test…mainly because, despite their lofty aims, IQ tests only measure information retrieval and utilization. They don’t actually measure abstract reasoning. for example, two people sit down to take a test and look at a problem that requires an individual to know about the ratio property of similar triangles. BOTH get that the KEY to solving the problem lies in the relationship between the two triangles. HOWEVER only ONE has HEARD or MEMORIZED the correct property. the other WILL HAVE the INTUITION, but he will not have the confidence to rely on this intuition in answering the problem (itself an indicator of intelligence and “high IQ” that the test will not pick up). ONE gets the question right. the OTHER gets it wrong. There are two specific types of smart people, intellectually interested and intellectually obsessive. Obsession leads to perfection. Education promotes intellectually interested but does not promote the obsessive intellectual. The intellectually interested, are interested in knowledge, but without having specific obsession. Having knowledge is good, but it is also important to use it as a self-promoting social and economic welfare. Most intelligent people are like that. Obsessive intellectually, by contrast, sees no knowledge, a way to make money, or as a secondary factor in your life. Knowledge, this type is not a means for achieving some purpose, since knowledge is the purpose itself. The higher the academic status, less intellectually obsessive. The selection in higher education is above all else, a non-selection of types with greater potential for innovation. Successful scientists are those who have managed to compile the monotonous demands of the academic environment with creativity. I thought “Regression to the mean” was so pronounced for IQ? Didn’t Stephen Hsu claim IQ could go from 140 to 110 in 3 generations? SAT is complete and utter garbage and has very little to do with real processing power. It’s all knowledge and academics. Rich parents don’t produce smart kids. They produce educated kids. I looked at the a SAT practice test and the first question was a quadratic equation. I closed it immediately. Of course wealthier kids would rank higher in a knowledge based academic test. This is astoundingly obvious. It’s mind blowing how obvious this is.